First off, Apex Tactical has exceptional customer service. Yes, Randy Lee and his crew have published instructional videos to assist with the installation of their products but they have also continued to upgrade their products as well. So while 99% of the information in the FSS install video remains accurate, there are a few things that changed when the new product launched. I was able to install the Forward Set Sear kit with polymer trigger in my M&P without problem but I had a few questions afterward. I used the Apex website contact form to submit them and received a response within just a couple of hours. If you are considering installing an FSS kit, maybe what I learned will help you too. Earlier this year I installed a DCAEK from Apex so with that experience, this installation went smoothly but because the parts weren’t labeled I wanted to ask what the difference between the two trigger return springs was. The answer I received (and I have labeled them as such above) is that the ‘green’ spring with the stepped coils is heavier and is intended for a duty/carry style trigger weight while the tapered silver spring is lighter for competition use. Current to January of 2013 all of our USB’s are the same across the board. Older versions of the kits had different USB’s. If both USB’s you currently have are domed and rounded and bought within this year they are most likely the same. However If you purchased the DCAEK awhile back before 2013 it is different from the FSS. This is good news, because now I have the option of swapping slides between my 5″ gun with the FSS and my 4″ gun with the DCAEK. Apex strongly recommends requires a sear block with the larger 1/8″ sear plunger and therefore only provides a 1/8″ spring. Currently the only 9mm/.357/.40 sear block offered by Brownells includes the magazine safety and internal lock [note to self: if the product description is unclear, read the customer comments before you order]. If you need a new sear block without the mag safety or the lock order this one from Speed Shooter Specialties. I installed the heavier of the two trigger return springs and it resulted in a 4lb 10oz pull in my gun. As stated in a previous post, to me, it feels lighter than that. The take-up is short and the break is the cleanest I’ve felt in an M&P pistol. The geometry of the system includes an internal overtravel stop so the free travel after the break is greatly reduced which in helps eliminate sight upset. After I’ve had a chance to shoot it [tomorrow?] with the heavier trigger spring, I will install the lighter one to see how it changes the pull and break. Randy Lee has said that the FSS kits are meant to approximate a 1911-style trigger in a striker fired gun. In my opinion, he has succeeded marvelously. 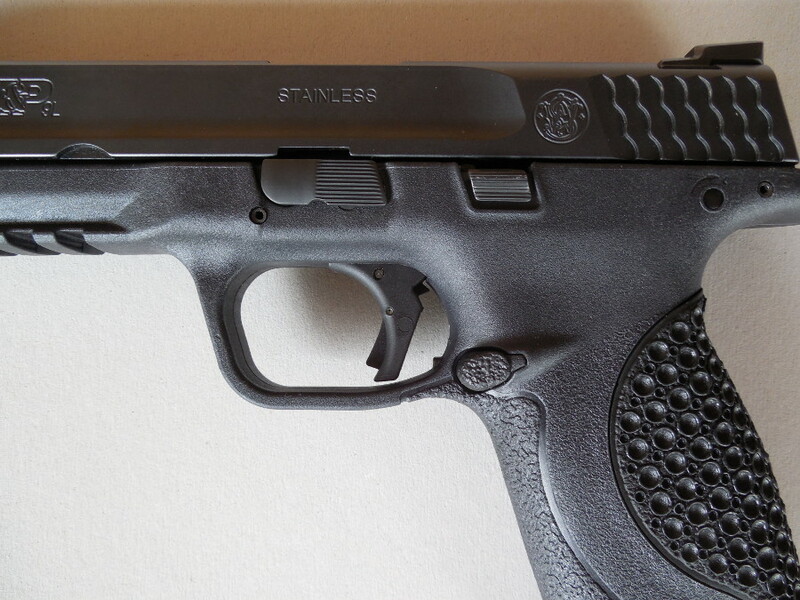 The most often heard criticism of S&W’s M&P series was regarding the quality of the trigger pull. 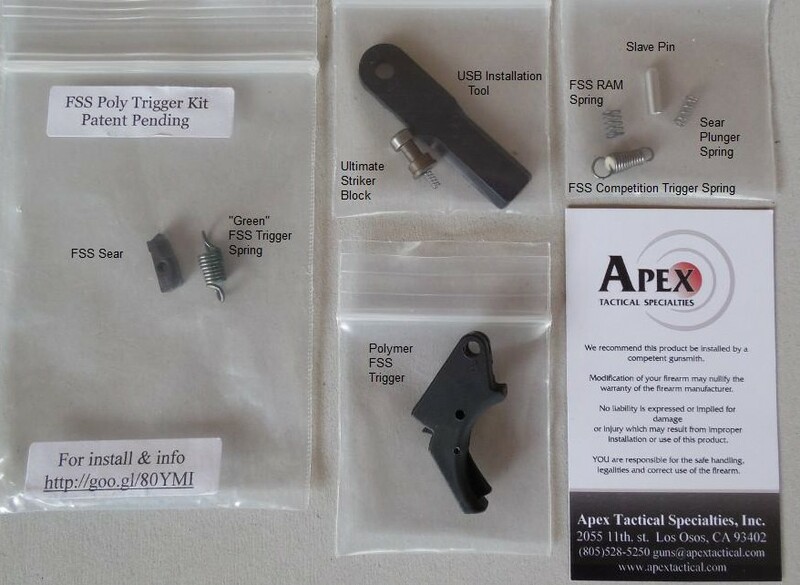 To their credit Smith and Wesson has listened to the market and worked to improve the factory triggers in recent production guns but if you want the best trigger, install a kit from Apex Tactical. 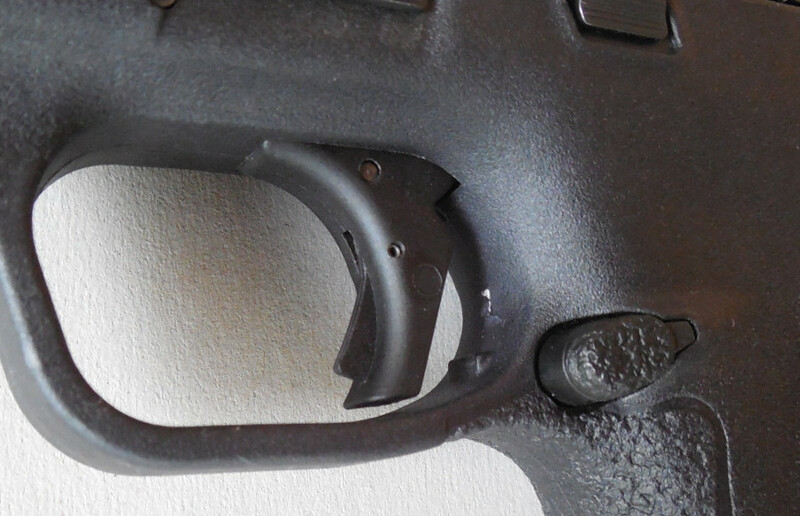 And here’s a close-up showing the face of the trigger. It has a more rounded contact surface than Apex’s aluminum FSS trigger. A review of the trigger kit will be forthcoming after I’ve had a chance to take it to the range. For now I can say that I am very impressed. The FSS kit has a short take up and a clean, crisp, short release that eliminates the ‘spongy’ break common to striker fired pistols. Initial measurements show a consistent 4lb 10oz trigger pull but it feels lighter than that.